1.Detect that if your car or office is installed with wireless wiretap or surveillance devices. 2.Detect if the cell phone is wiretapped or abnormal (eg: transmit signals without any reason at standby mode). 3.Detect if your car is installed with GPS tracking wiretap or GPS tracker. 4.Detect if there is any roof radioactive base station in your working environment or residential buildings. Before buying buildings, first detect if there is harmful electromagnetic radiation to people's health. 5.Detect smart devices` receiving and transmitting signals of message service, signals network, signals of power on/ off status. 6.Inspect hotels, restrooms, guesthouse, entertaining places, dressing rooms to prevent wireless pinhole cameras. 7.Detect if household appliance like microwave oven leak out the harmful electromagnetic radiation. 8.Detect if there is acute radiation called"cell phone killer"in your staying places. 9.Detect if there is suspicious wireless signals in your staying places. Prevent wireless wiretapping at the places of ATM machines, theatres, art galleries and museums, etc. With auto-detection function. As long as you carry the host machine, any eavesdropping devices in living environment, pinhole cameras, Casino gambling frauds, etc can be detected by sending you a risk prompt via the means of auto-body vibration. Features environmental economy, high temperature resistant, corrosion resistant, easy to install, super environmental suitability and stability, low-voltage prompts. Laser Detection: Windows host can be seen through the eyes of all within sight of the camera facing the camera. Adjustable potentiometer sensitivity. 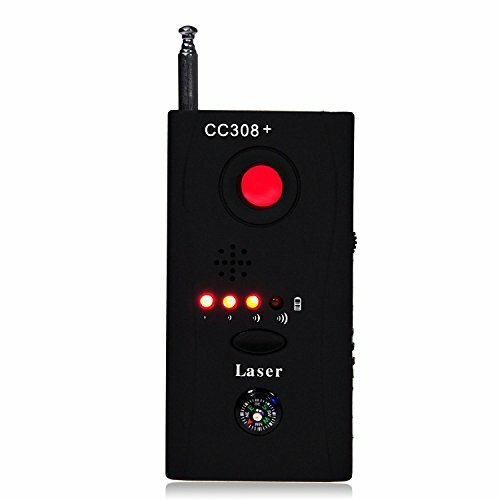 (Greater/ smaller sensitivity can widen / narrow the detection scope ) This device can quickly identify the source signal waves with the help of equipped strong signal indicator light. Laser detection camera sets the distance range from 10cm to 10m (the naked eye can identify red flashing). Radio detection of camera range from 5cm to l0m ( Transmission power distance was decided according to the size of camera). If you have any questions about this product by HLENSIX, contact us by completing and submitting the form below. If you are looking for a specif part number, please include it with your message.